Greetings again from the darkness. When a film is inspired by a true story detailed in a 2014 New York Times article entitled “The Sinoloa Cartel’s 90 Year Old Drug Mule” written by Sam Dolnick, we should expect a message delivered with a certain amount of tension. Unfortunately, tension is somehow lacking throughout, and the only real message delivered is the same of most every elderly person (even those who aren’t drug runners) – they regret not spending more time with family. That’s not to say the movie doesn’t have its moments (it does), but know going in that the terrific ensemble cast is given little to do in a script painted with such broad strokes that no other message or image ever emerges. Clint Eastwood directs his second movie of the year (THE 15:17 TO PARIS being the other) and stars in his first acting role since TROUBLE WITH THE CURVE in 2012. Here he plays Earl Stone, a popular horticulturalist who admittedly devoted more time and love to his prize-winning daylilies than to his family. A flashback to 2005 shows us Earl in his element at a convention where he is treated as a celebrity, and as a man who would rather buy a round of drinks at the hotel bar than show up to his daughter’s wedding and walk her down the aisle. The family has grown weary of and accustomed to his no-shows, and Earl displays little remorse. Pushing forward twelve years, we find Earl’s house and farm in foreclosure – and him blaming the internet (just one of many ‘good old days’ syndrome bits). 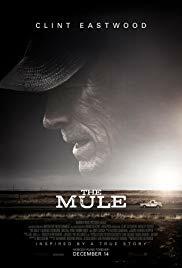 When his appearance at his granddaughter Ginny’s (Taissa Farmiga) engagement party causes turmoil with his ex-wife (Dianne Wiest) and daughter (the aptly named) Lilly (Alison Eastwood), he is approached by one of the attendees who tells him he can make money ‘just driving’. Being hard up for cash, Earl takes the job driving his truck and dropping off his unknown cargo. In one of numerous convoluted moments we are supposed to accept, Earl is shocked when he discovers the cargo he’s been toting is bags of illegal drugs. Now mind you, this is a Korean War veteran who has spent his life on the road running his own business. The naivety is a bit too much for us to swallow. Comparisons are expected to Eastwood’s turn as Walt in GRAN TORINO (2008), but here his being an off-the-cuff racist is seemingly excused by his age and generation … plus it’s meant as comic relief quite often. Earl becomes a trusted mule for the cartel led by a kingpin played by Andy Garcia, and transports record amounts of drugs valued at millions. Still, Earl is a cranky old geezer who does things his own way, whether that’s stopping for the world’s best pulled pork sandwich or helping a stranded family change a tire. He’s also a 90 year old with the libido of a 28 year old gigolo (which given Eastwood’s real life track record, may or may not be fiction). While Earl makes his commutes through the picturesque Midwest (including White Sands National Park) singing classic country songs and ballads, the Chicago DEA is busy tracking the cartel. Two partner agents (Bradley Cooper and Michael Pena) report to the Station Chief (Laurence Fishburne) and are under pressure for drug “busts”. It’s this segment that truly causes the story structure to crumble. Cooper, Pena and Fishburne are all excellent actors and it’s a bit embarrassing to see them with such limited and basic roles. Fishburne especially seems relegated to intricate dialogue such as “get it done” and “do it”. There is also a Waffle House scene shared by Cooper and Eastwood that so unreasonably requires us to suspend all disbelief that it ends up just being an eye-roller. One’s expectation for the film should be tempered by the knowledge that Earl’s line, “For what it’s worth, I’m sorry for everything”, is really the crux of the film. An elderly drug runner’s life regrets and attempts to make amends and re-connect with his family somehow plays like a disjointed soap opera than a real life drama. That said, even at age 88, Mr. Eastwood still has a strong screen presence, and we can’t help but find it interesting that both he and Robert Redford (THE OLD MAN AND THE GUN) had roles this year as criminals with a certain appeal. Greetings again from the darkness. The mystery of why Ant-Man was not involved with the battle for the galaxy in AVENGERS: INFINITY WAR has been solved as director Peyton Reed returns to helm the sequel to his 2015 hit ANT-MAN. The reason is very simple: Scott Lang/Ant-Man was under house arrest for his role in CAPTAIN AMERICA: CIVIL WAR. Yep, an ankle monitor sidelined this superhero for the biggest, baddest clash with Thanos. Somehow, this seems fitting for the most “normal” and grounded of all the Marvel characters, as Scott (Paul Rudd) is just a guy trying to overcome his petty thief tendencies while becoming a better father. The story picks up two years after “Civil War” and Scott has only 3 days of house arrest remaining. An unusual “dream” is the cause of his reluctant reunion with Dr. Hank Pym (Michael Douglas) and Hank’s daughter Hope (Evangeline Lilly). A remarkable laboratory (quite the sight-gag), that could also be carry-on luggage, is the source of Hank and Hope’s mission to bring back mother Janet (the original Wasp, Michelle Pfeiffer) from the Quantum Realm. It’s at this point, if you are a Marvel Universe fan, that you might ask yourself … so the story is about trying to save one person who has been gone for 30 years? Yes, that’s a bit less pressure than being charged with saving the galaxy, which is common occurrence in other Marvel films. Look, this isn’t rocket science. Umm, well, it’s quantum physics, which is way more complicated … but the point is, Ant-Man is the Marvel fluff piece. Its purpose is to be light-hearted and entertaining, rather than burdensome and ominous. There may not be an overabundance of depth to the story, but it is overflowing with entertainment value. There are four new writers (along with Mr. Rudd) for this sequel, and they offer up a nice blend of personal redemption, crazy action sequences, and heart-felt emotion. The villains aren’t even all that bad. Walton Goggins (“Justified”) is Sonny, a greedy dude who just wants the other-worldly Pym technology, and Ghost (Hannah John-Kamen) is after that same technology, but only for self-preservation. Her own molecules are separating, causing a fast track to death – despite the help of Hank’s old partner, played by Laurence Fishburne. The age-reversing effects we saw on Michael Douglas in the first ANT-MAN are also used this time on Mr. Fishburne and Ms. Pfeiffer. It’s quite something to behold. Michael Pena returns as Scott’s motor-mouthed partner, and he displays some pure comic genius in the truth serum scene. Randall Park plays the hapless FBI agent in charge of keeping track of Scott, but it’s Abby Ryder Fortson as Scott’s daughter Cassie who steals every one of her scenes … and possibly sets the stage for the Ant-Man franchise to carry on to the next generation. Only a certain level of seriousness can be attained for a movie that blasts “The Partridge Family” theme song “Come On, Get Happy”. Or that awards Paul Rudd with a certain trophy designation. Or that has a character scream “You got Pezzed!”. However, a level of respect is earned with some terrific action – giant and tiny – as well as an exceedingly creative chase scene through the streets of San Francisco. There is a post-credit stinger that ties the film into AVENGERS: INFINITY WAR. It’s brilliant, but also caused quite the outburst from my fellow viewers. 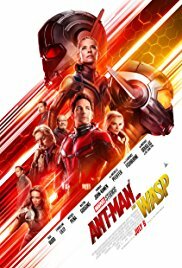 If you enjoy playful and amusing (and you should), then the team of Ant-Man and The Wasp (comedian and straight man/person) will put a smile on your face – just watch out for the seagulls! Greetings again from the darkness. 75 years ago, the first Superman comic book was published. It would be quite challenging to find very many kids who have not imagined themselves as Superman at some point during that time. Numerous Superman re-boots have occurred in various media: comics, TV, movies, video games, toys, etc. ; and the bigger the fan, the more etched in mind what the Man of Steel should look and act like. Woe to the filmmaker who doesn’t share that fan’s vision. Enter director Zack Snyder, writer David S Goyer, and writer/producer Christopher Nolan. This cinematic triumvirate has been responsible for such comic based movie material as The Dark Knight franchise, 300, Watchmen, and Blade. Some of the criticisms of this most recent Superman presentation include a lack of fun, the absence of humor, no love story, too much backstory, an overabundance of action and CGI, and a hero that is much too serious … and that’s a list ignoring the outcry over the redesigned suit sans red briefs! As with anything, the closer to the heart, the less amenable to change folks become. At least no one is complaining about the lack of phone booths! This movie has quite the balance of visual effects and backstory. It’s clearly designed to be the first in a series, and because of that, we get the foundation of Superman: the rare natural born baby on the planet Krypton – a planet speeding towards destruction. Jor-El (Russell Crowe) executes his plan to save his newborn son Kal-El by rocketing him off to Earth. While that’s happening, General Zod (a raging, wide-eyed Michael Shannon) stages one of the most ill-timed coups ever … he tries to seize control of the dying planet. This opening sequence is filled with some of the biggest, loudest effects of the whole movie. It’s a jolting start that I wasn’t particularly fond of, but it’s obviously well done and with purpose. Kal-El lands on earth and becomes known as Clark Kent, adopted son of Kansas farmers played by Diane Lane and Kevin Costner. Most of Clark’s childhood is glimpsed through flashbacks of specific events, and serves the purpose of giving us a taste, while not delaying the appearance of Superman … though that name is only heard once (maybe twice). In an attempt to hide his powers, Clark becomes a drifter. However, it’s impossible to keep your superhero powers secret when you rescue a group of oil rig workers by walking through fire and using your super strength. Enter “Daily Planet” super-reporter Lois Lane (Amy Adams). She’s good at her job and easily figures out the big secret. But rather than contact TMZ for a giant pay day, Lois understands that this may be something the world just isn’t ready to learn. Wise lady. The relationship between Lois and Clark is rudely interrupted by the reappearance of General Zod and his right hand lady-warrior (Antje Traue). See, Zod thinks he can takeover Earth and re-establish his Krypton roots … and Superman holds the key to his plan. If you are a Superman fan, all of this makes perfect sense. If not, I suspect this movie will not hold much interest for you. If you are a fan of the 1978 version with the late, great Christopher Reeve, I would encourage you to keep an open mind. While that version flashed frivolous whimsy, this one is darker and more philosophical … more in line with what you might expect from an alien with super powers. Still, the subtle humor abounds here if you keep your eyes open. LexCorp references appear along with little touches that can bring a smile (12th ranked Kansas Jayhawks football??). The acting is superb throughout. Henry Cavill was the runner-up to Daniel Craig for the James Bond role, but he immediately stakes his claim to the Man of Steel. His overall look and amazing physique leave little doubt that he is Superman, and as a bonus, he is plenty of reason for the ladies to purchase a ticket. Hans Zimmer makes no attempt to one-up John Williams’ iconic score from the 1978 film, yet he makes his mark, especially during the action sequences. Be prepared as this one is heavy on the Sci-Fi angle, and there is also an interesting Jesus comparison that can be made (he is 33 years on Earth). Doing the right thing has always been the recurring theme for Superman and this movie version helps us understand where the moral fiber was born … the hint is in the Royals shirt Clark wears. In addition to a terrific Smallville set, we get Laurence Fishburne as Perry White, a role which will surely be expanded in the sequel. It’s very interesting to see the Snyder, Goyer, Nolan vision, and if you are still clinging to 1978, you might find yourself asking … Why so serious? **EDITORIAL NOTE: There has been much movie talk recently about the superhero overload and the over-the-top CGI onslaught. “Too many explosions“. “Too many special effects“. “No focus on the story“. “Enough with the superheroes“. While I certainly can understand that movie preferences may run 180 degrees from The Avengers, Iron Man, and Man of Steel, my response to these voices is two-fold. First, movies are considered an art form, but never forget that it’s also a business. The goal of a business is to turn a profit. When you look at the financial returns of the above mentioned movies, as well as Nolan’s Dark Knight series, one might allow a bit of leeway to Hollywood studios and producers. There are only so many legal ways to earn a half billion dollars, and superhero movies are on the short list. My second response is to encourage the haters to accept the role of these blockbuster films, while continuing to seek out the more personal and intimate independent films that gain distribution. My personal taste in movies runs the gamut from Iron Man to Mud to Toy Story to the most recent documentaries. I am in awe of the wide variances and multi-talented people involved in movie making. So while I may avoid the latest Kate Hudson rom-com, I do understand there exists a group of people who are giddy in anticipation. Rather than expend negative engergy towards the blockbuster explosions, know that the billion dollar box office hit keeps a multitude of artists working. And that’s a good thing. Greetings again from the darkness. If you are a fan of the 1987 original film directed by John McTiernan (Die Hard) and starring Arnold Schwarzenegger, you couldn’t help but be a bit excited about this new one since Robert Rodriguez is involved. What a letdown. It plays more like an episode of Lost, or even The Twilight Zone. With films from Mr. Rodriguez, we have always been able to count on creativity, ingenuity, humor and excitement. This one lacks all. Now to be fair, the director is actually Nimrod Antal, whose resume includes Armored and Vacancy, both of which are as empty as this one. But Mr. Rodriguez was very involved in the details. Of course when your cast is minus Arnold, you start with a major handicap. When you replace him with Adrien Brody, you appear to be aiming for disappointment. Sure Mr. Brody did a few sit-ups to prep for this role, but he is no action hero, regardless of how he mimics the Christian Bale Batman voice in order to seem tough. The rest of the bad luck cast of characters is rounded out by Laurence Fishbourne, Alice Braga, the great Danny Trejo (a Rodriguez staple), Topher Grace and Walton Goggins (so great as Boyd Crowder in Justified, TV’s best new series this past season). Just to add to the misery, the film score is simplistic and a bit of a joke itself. It certainly misses the excellent work of Alan Silvestri from the first film. Not much need to discuss the lack of any real new material here. The bad guys are pretty much the same. The weapons are pretty much the same. The cast and script are weaker. The real money with this one lies in a “making of” documentary in which the first “pitch” meeting takes place and the producers are presented with the idea to make a thrilling new action movie … a new Predator movie … starring … Adrien Brody and Topher Grace!